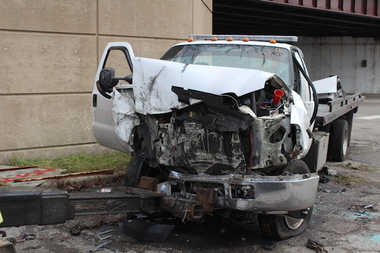 The man crashed into a viaduct under the Chicago Skyway after he was shot multiple times. PARK MANOR — A 32-year-old man was shot to death Thursday morning while driving a tow truck near the Chicago Skyway in Park Manor, police said. Around 8:40 a.m., Lutredze Evans was driving northbound in the 6800 block of South Anthony Avenue when someone repeatedly shot at him through the windshield of his car, according to Officer Jose Estrada, a Chicago Police spokesman. Evans, of the 8300 block of South Rhodes Avenue, crashed his car into a viaduct in the 6800 block of South Martin Luther King Drive, Estrada said, after being shot multiple times in the chest and arms. He was brought to Stroger Hospital, where he was pronounced dead at 9:43 a.m., according to Estrada and the Cook County Medical Examiner's office. By noon, the truck was being removed from the scene of the shooting.